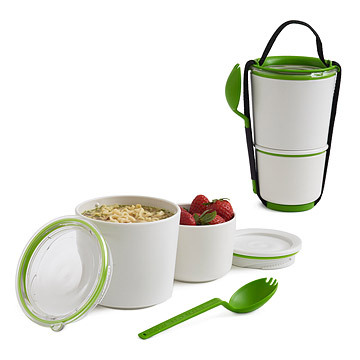 Composed of two airtight containers, this stacking set is designed for easy, on-the-go dining. Simplify the process of packing (and carting) your lunch with this versatile lunch pail, designed with airtight containers and a smart stacking system for keeping food fresh and portable. Its two bins keep servings separate and cleverly pile into a tight, vertical column that saves space--and spills!--when you're commuting from one destination to the next. You can pop either section into the microwave for a hot main dish and just as easily pop it into the dishwasher when you get home from work. Packed with a handy, reusable "spork" and a carrying strap, its thoughtful design is sure to please adults and teenagers alike. Made from sturdy, BPA-free polypropylene plastic. Made in Taiwan. Check out the gift lab of the Stackable Lunch Pot on our blog! 4.25" W x 7.5" H; Top Pot Holds 18.6 fl. oz, Base Pot Holds 10 fl. oz. I bought this as a white elephant gift for coworkers and it was a hit! Great for work commute and holds plenty for lunch. This is a well made quality item. I am very happy with every aspect of my order. It has a clear top so you can see what is inside the container. Screw top lids. Dishwasher safe. Microwave safe. Freezer safe. Holds a good-sized portion, too. She uses it to store food so she can go to school. must have! great product to store food at the office. I'm going to order another. I purchased this in addition to the Flavor Infuser Water Bottle for my mother for her birthday recently. She has been trying to get healthier but had a hard time when it came to food and drink. This is a cute and extremely travel friendly lunch container that helps her with portion control as well as being an easy all-in-one solution. She loves it and has purchased a few more! This was a wonderful gift..lightweight, cute, and easy for on-the-go snacks or light lunches.